Zynga, the online game developer of Farmville and Scramble fame, may be looking to split from its primary platform partner, Facebook. According to a report from Techcrunch, Zynga is gearing up to launch its own social gaming network called Zynga Live. Zynga is responsible for some of the most popular apps on Facebook. According to All Facebook's app leaderboard, four Zynga apps are currently in the top ten, including number one Farmville, number six Café World, and numbers eight and nine, Mafia Wars, and Petville. Zynga also makes games for other platforms, including MySpace, MSN, My Yahoo, and the iPhone. "Pincus announced at a 5pm meeting yesterday at Zynga that Zynga was going to launch a social game network called Zynga Live. The Zynga Live initiative was a social gaming network. Facebook and Zynga has been negotiating on Facebook Credits and the talks turned for the worst. In the negotiation process, Facebook shut off Zynga's feeds and threatened to shut down games. Zynga in the process threatened to completely leave Facebook and prepared to do so in the previous upcoming weeks." The credit concern comes from Facebook requiring Zynga and other developers to use "Facebook Credits" as the only payment platform. Facebook takes a whopping 30 percent fee for the use of Facebook Credits. Sources also say that Facebook is trying to get Zynga to enter into a deal where Zynga agrees to remain on Facebook as their primary games platform. Negotiations aren't going too well -- Facebook has shut down notifications for some of Zynga's games (including Farmville) and has threatened to remove some of Zynga's games completely. 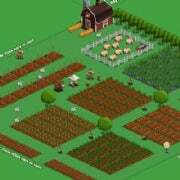 In response to Facebook's "punishments," Zynga has prepared to move away from the social networking site, beginning with its launch of Farmville.com. I'm going to have to agree with CNET's Daniel Terdiman, though -- I find it hard to believe that either Zynga or Facebook is going to walk away from their (thus far) successful relationship. Zynga needs access to the millions of Facebook users who play their games, and Facebook needs Zynga to provide a reason for many users to check into the site so routinely. Still, as an anonymous Techcrunch source stated, it looks like the tension is getting "intense."